What Animal Is Making Noises In My Wall? From tapping to scratching to squealing and thumping, noises inside your walls can be normal. However, if the noises you are hearing aren’t mechanical, they could be from animal activity and should be addressed right away. Squirrels are erratic, often scurrying, but are somewhat easy to identify because they like schedules. You will usually hear them in the morning when you are rising for breakfast and during evening times when you’re getting ready for dinner because squirrels venture outside during the day to look for food and then come back in the evening to find warmth and shelter. If you bang on the wall, squirrels will get frightened, and you will hear them scurrying as they run off. Bats will be easier to see than to hear. Listen for a scratching sound from the tiny claws on the elbow of their wings, if you think you have bats. In addition to scratching sounds, squeaking in the walls may also be a sign of bats as they try to climb up the interior of the walls. Mice often make noises right before homeowners go to bed. You will hear tiny scratches isolated in one area of the wall, as well as chewing noises. If you go up to the wall and bang on it, generally mice will stop what they are doing for a minute or so, then you may hear the mice run down the wall or up to the ceiling. Rats will be more active at night since they are nocturnal. You will hear some squeaking, but you will mostly hear chewing and the fast pitter-patter sounds of their feet as they move through the walls. Raccoons will be heard at night as they are nocturnal animals as well. If raccoons are in your walls, you will hear heavy scratching, loud thumping, crying sounds, and hissing. If you hear a chirping sound very similar to high-pitched sounds that birds make, there could also be raccoon babies living in your home. Birds will nest inside walls and can be identified by listening for light pecking noises or beak tapping. If adult birds are constantly going and coming from the nest, the activity can be quite noisy. You may also hear chirping and flapping if a bird gets trapped inside the walls and is trying to escape. 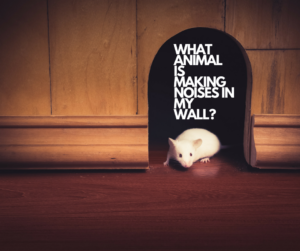 If you hear noises inside your wall, contact Critter Control® of Dallas to perform a free animal entry home inspection. Our certified wildlife management technicians will identify the cause of the noises, and locate and remove the animals from your home. After we remove the animals, we’ll help keep them out by sealing all the entry ways in to your walls or attic. We can even repair the damage caused by the pests while they were making your home their own. Call Critter Control® of Dallas at 817-222-1101, and let us show you why we’re the best choice in animal removal.